“Mountain Rose” is a placid, ambient piece which features McCaslin. The trio provides a soothing backdrop to the saxophone. McCaslin explores freedom throughout the song. “The Realm” is a two-part song. The first movement begins softly but grows in intensity with McCaslin putting the tenor through some passion-filled rolls. Then, the foursome cranks up the energy, continuing the theme at a faster pace. McCaslin is at times frantic, all the while engaging, rolling up, rolling down and basically playing “outside the box.” Then Andrew takes point at a fever pitch. Hutchinson and Schwonik stretch out plenty in the background, the latter injecting some timely cymbal splashes. “Prairie Wind,” for all intents and purposes the album’s title song, reflects the visual of the cover art. On the front, an open field of yellow flowers with dark clouds overhead and a tree line in the background, a large sphere off to one side, reflecting sky and ground. On the back, the same setting minus the sphere and with more open space. That’s the approach the trio takes. Just relax and enjoy the great outdoors. One can almost feel the breeze that’s pushing those clouds. The trio is a fixture on the Western Canada jazz scene. Working together for eight years, the music mixes contemporary swing, Latin, odd meter and acoustic groove. The sound represents the regions where they are from, the prairies and Rocky Mountains, as well as some of the vibrant, young cities of the Canadian West. 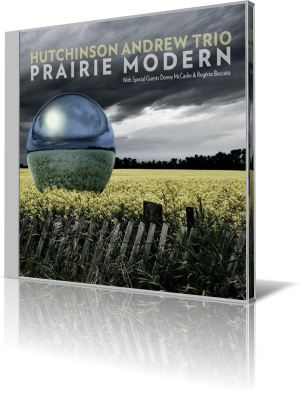 Prairie Modern captures all of those elements.